White peonies for sale to gardeners. Deeply cut white petals in single or semidouble form. Flowers feature a white to light lime green base with white and lime streaking on the petals which are tipped by soft pink accents. 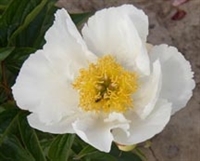 A pure white bomb-form peony. All-white anemone form blooms, no staking. A white cutflower classic. The plant is more compact than many, topping out at about 28 inches, but its blooms are large and nicely formed. 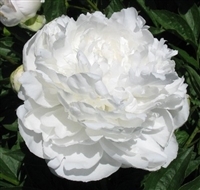 Lightly fragrant, brilliant white blooms top 26-inch stems on this sturdy landscape peony. Finest double white large symmetrical rose-form blooms. This compact charmer grows to just 22-inches in height. 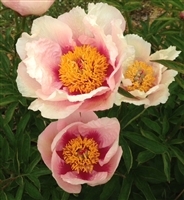 Single white peony with yellow stamens, 34-inch tall stems. Award of Landscape Merit winner. Early flowering, the double white blooms carry a rose-like fragrance. 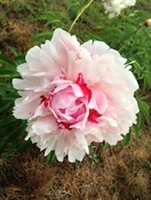 Creamy white petals feature splashes and streaks of red and pink much like peppermint candies. Fragrant. Puts out a blizzard of white double blooms on a compact 26-inch stems. Rare apple-green guard petals create the base for a central tuft of creamy white petals and petaloides. A Japanese lactiflora, boasts lots of double white blooms heavily streaked by raspberry red stripes. Very early blooming, single pinkish coral fading to cream with lavender flares.